Here’s a marvelous Old Photo Postcard! This one shows a lovely French Lady in a stylish Art Nouveau Costume! She’s wearing loads of Jewelry (I see lots of Pearls there) and an elaborate Headdress on her head! She’s even wearing some pretty Earrings. 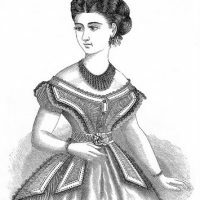 Her clothing is quite detailed as well, with quite a few appliques sewn on to it. I love the little blue postage stamp at the top, I think it looks great with the Sepia tones of the card, so I left it intact. A nice Old Photo for your Collage or Mixed Media Art Projects! Beautiful old photo, Karen! Thank you! Yes this is pretty cool! Thanks! What an incredible outfit, wonder what occupation she had to wear that or if she just dressed that way ordinarily. It all looks heavy to wear. I wonder what people’s lives in the pictures were like. Wonderful images Karen, thanks so much. My guess would be that she’s an actress, but it doesn’t say on the card, so I can’t say for sure. ohh wOw this is gorgeous!!!!!!!! thanks so much!!!! 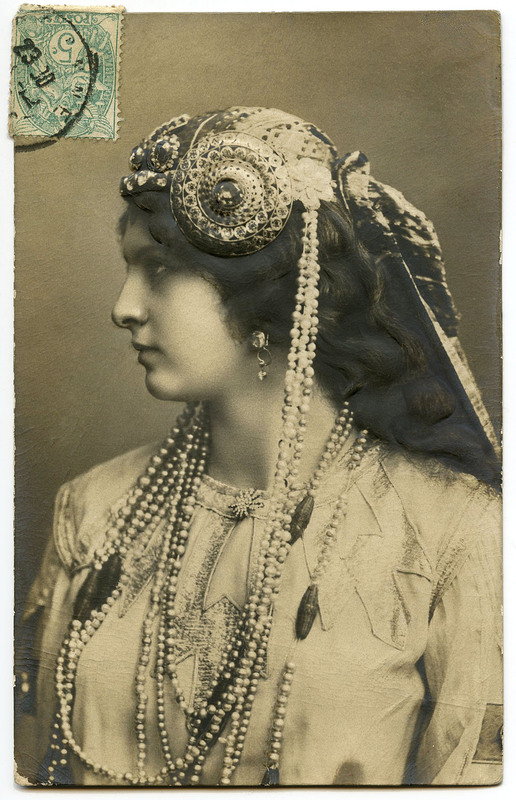 This is really a lovely old postcard…fabulous jewelry! The lady has a lovely profile. I imagine she is a gypsy of sorts. What a tale one could think of this postcard!